Since there are many different styles that you could wear your natural hair in, you have an option of using a variety of natural hair styling products to style your hair with. However, the type of styler that you would use in your hair will all be determined by the look that you’re going for, as well as your hair’s reaction to the products. I myself have tried out some of these products for my twist outs and I must say that I loved the results. 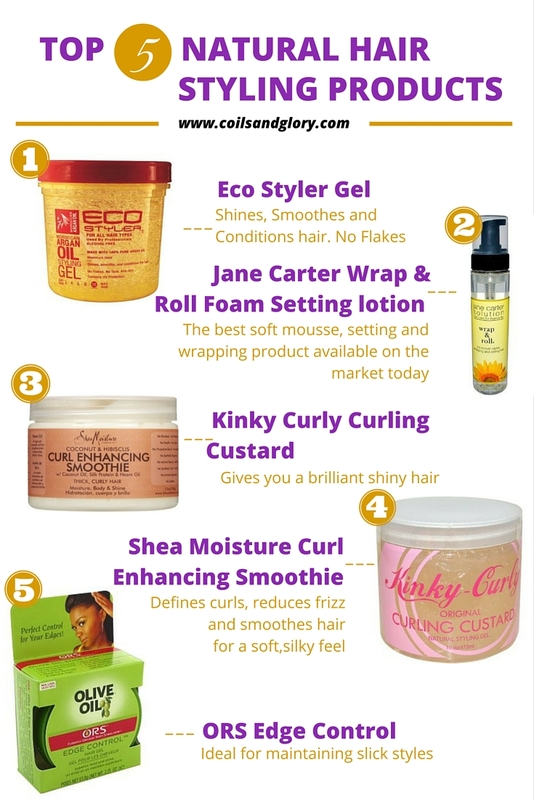 So, if you’re looking for the perfect natural hair styling product to use in your hair, here’s a list of the top 5 products that Naturals love to use to style their hair. 1. Eco Styler Gel . Any of the Eco Styler gel would do. Though I’ve only tried the Argan Oil & Olive Oil line. Price: from $8.59 for the 16 ounce size. Product Description: Jane carter solution wrap and roll is the best soft mousse, setting and wrapping product available on the market today. It dries clean and soft without leaving and residue. Great for dry color-treated or damaged hair, the natural glycerides, essential oils and moisturizers leave your hair soft and shiny. Cut dryer time in half by applying wrap and roll liberally to wet hair, then wrap/set and dry as usual or let it dry naturally. Ingredients: Purified water, anthemis noblis flower, symphytum officinal leaf, equisetum arvense, urtica dioica (nettle), rosemarinus officinalis (rosemary) leaf, humulus lupulus (hops), lawsonia inermis (henna), coco-sultaine, glycerides, essential oils, wheat germ protein, diazolidinyl urea, lodopropnyl butylcarbamate, fragrance. Product Description: SheaMoisture’s Coconut & Hibiscus Curl Enhancing Smoothie defines curls, reduces frizz and smoothes hair for a soft, silky feel. Restores moisture, creates brilliant shine and conditions hair without weighing it down for bouncy, healthy curls. Made with natural and certified organic ingredients. Coconut Oil hydrates and protects hair while reducing breakage. Silk Protein smoothes hair for a soft, silky feel. Neem Oil controls frizz while adding brilliant shine. 5. ORS Edge Control : This isn’t really a styler but a style “finisher”. Meaning that it’s a great product to use around your edges to give you that polished look. Product Description: Olive Oil Edge Control slicks and holds down edges while adding shine and moisture to the hair. This non-sticky non-greasy formula provides excellent hold without hardening the hair. Ideal for maintaining slick styles. Ingredients:Aqua, Cetereth-25, Peg-7 Glyceryl Cocoate, Propylene Glycol, Peg-7 Hydrogenated Castor Oil, Olea Europaea (Olive) Fruit Oil, Aloe Barbadensis Leaf Juice, Glycerin, Cocodimonium Hydroxypropyl Hydrolyzed Wheat Protein, Parfum (Fragrance), Benzyl Benzoate, Citronellol, d-Limonene, Eugenol, Geraniol, Hexyl Cinnamal, Lilial, Linalool, Methyl Ionone Diazolidinyl Urea, Methylparaben, Propylparaben, Dmdm Hydantoin.